Fine grit for stoning and cleaning tight corners and recesses. 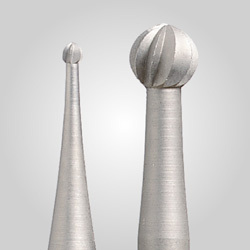 Measures 1" long x 1/8" diameter and tapers to a point. Use in Engraver's Chuck XT1 (see "Related Products" below). Norton brand India sharpening stones are made of synthetic aluminum oxide abrasive graded to a consistent particle size, blended with select bonding agents, molded to shape and finished to exacting surface configurations. 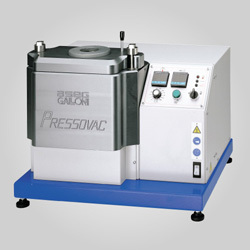 Preferred for imparting durable, smooth cutting edges and finishing to close tolerances. Orange-brown in color. Prefilled with oil to make cutting easier and more effective, retard loading and eliminate the need for presoaking prior to first use. Note: Although prefilling minimizes the amount of oil needed, it does not eliminate the need for oil on the stone surface. Apply Gesswein Stoning and Lubricating Oil on the stone’s sharpening surface prior to each use. This will prevent the pores of the stone from filling with material removed from the object being stoned. India Stones are available in course, medium and fine grits. 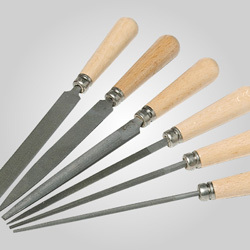 Use coarse grit for restoring badly worn cutting edges and for all sharpening not requiring a keen edge; use medium grit for producing an average edge on a broad range of tools, such as carving tools, milling cutters, lathe tools and die chasers; and use fine grit for producing sharper-than-average edges on gouges, reamers, taps and twist drills.